Shame is such a powerful emotion that it is able to bind both the mind and the spirit as well as undermine the body. In fact, it is able to rob the individual of all its clarity, sense of self and perspective – such is its all-pervading and disabling influence. This diagram attempts to simplify the defining force of shame in our lives. 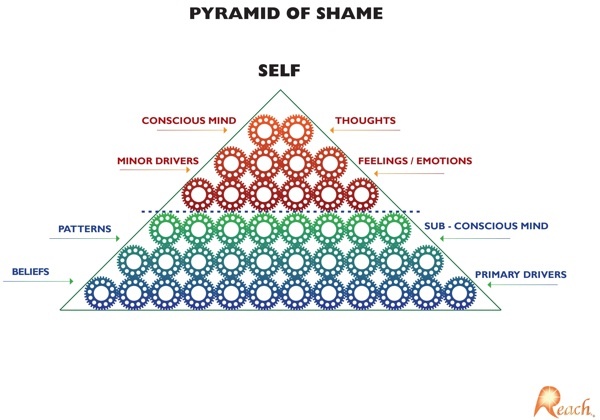 We’ve used a ‘pyramid of cogs’ to illustrate how the dynamics of shame operate; with primary and minor drivers responsible for how shame feeds into our habits, moods, attitudes and beliefs. Shame is that feeling of ‘not being good enough’. It’s the fear of being found out and exposed. When we’re in its grip it demands our total obedience and its power is such that it often gets its way. As you can see from the diagram, this is because shame not only manipulates the conscious mind but through its vast machinery of influence it is also able to indoctrinate the sub-conscious mind too. The minor drivers are our feelings and emotions and they largely influence our day-to-day attitudes, behaviours and perceptions but beneath them are the primary drivers – which are really running the show. They are made up of those patterns and beliefs that have been established over the course of our lives. It is these patterns and beliefs that are then responsible for our view of ourselves and the world. The psychological hold shame has over us is such that it controls much of what we are doing without our knowledge. We’ve used cogs deliberately to illustrate the truly industrious nature of shame. It’s so hard working and efficient, with a self-propelling habit. So much so that when left unchecked it keeps rebuilding itself on the basis of the previous patterns that have already been laid down. It’s this perpetual nature of shame that makes it such an undermining force in our lives. Everything that’s unfolding in your life that you’re currently dissatisfied with, is happening as a result of the relationship between these cogs. This is why if you can identify the primary drivers and then remove them from their spindles, the whole of this pyramid of shame would collapse. It’s important to stress that the individual would not collapse; on the contrary, she would discover the foundation to establish a life free from shame. So if you begin by indentifying your demons and follow that trail you will then be able to discover what your primary drivers are and their reasons for being (see N.O.S.E.). Fear prevents us from making this discovery. Fear would have us believe that we are better off leaving things as they are. But nothing could be further from the truth. When we buy into the illusion that these things are best left to their own devices we choose a life of slavery, a life where our decisions and choices are not really our own, they are constructed out of the relationship between fear and shame. It should be understood that looking at our shame does not in any way dismantle us; it may feel like that in the first instance but in truth we are being reconstructed…. in fact, transformed. We are being offered freedom and a chance for a new beginning, one in which we no longer have to pretend, deny or hide in order to survive and thrive in the world. Find a way to take the journey of shame. You may need the help of someone who will truly empathize and understand, preferably someone who’s already travelled this path. Whatever is your preference, please take this journey making kindness and patience your companions, then it will prove easy to dismantle the pyramid of shame. Once it is brought to the ground you can begin anew, discovering parts of yourself that hitherto had not had the opportunity to be expressed. Taking this journey with the right person, in the right way, is definitely not something to fear; it offers you only freedom. What Makes The Reach Approach Unique? Do Bacteria Affect Our Moods? Amino Acids - the Unsung Heroes! The Need to Slow Down! What is The World Worth? Who Are You When No One Is Looking?